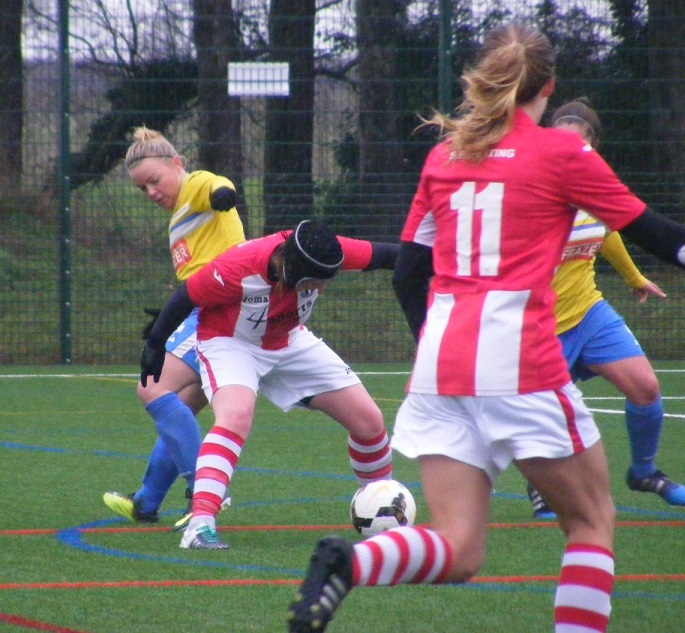 The action on the Supporting Women's Football Blog this Sunday comes from the quarter finals of the Norfolk Women's County Cup, with ERWFL Premier Division side, Acle United Ladies hosting King's Lynn Town Ladies from Norfolk Women's Division One. 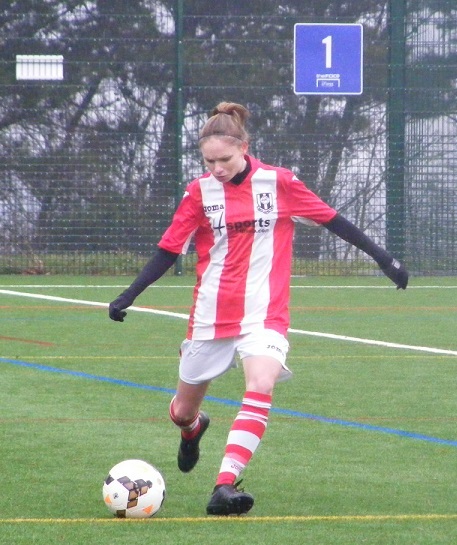 A wet Sunday right across the country saw a large number of fixtures called off, with their fixtures already piling up, Acle United Ladies took the decision early to switch the game to an all weather 3G pitch, at Flegg High School in Martham where the side trains during the week. 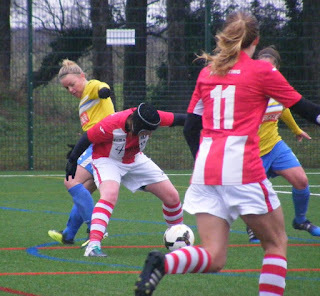 Acle United Ladies play their football 2 leagues higher than their opponents today in the County Cup 1 of 3 sides in Norfolk who play their football outside the county leagues. Currently 7th in the ERWFL Premier Division table have games in hand on all the sides above them. Won the Norfolk Women's County Cup 2 seasons ago. Entered this years competition in the 2nd Round winning 4-3 away home against Norfolk Women's Division One side, North Walsham Angels Ladies. Acle announced the signing of California State University San Bernardino scholar Megan Todd earlier in the week after obtaining international clearance, makes her debut in the County Cup. A nice 3G facility at the Flegg High School, room for spectators to stand beside the pitch, hot and cold drinks available from vending machines. A narrow pitch. Like I said a wet day across the country the waterproofs were needed the umbrella up, making juggling a camera and notepad tricky, but at least keeping both dry. Acle United Ladies starting XI - Chloe Nixon, Anna Larkins, Luka Goodchild, Chloe Shields, Kate Pasque, Amber Rowland, Alice Ladbrooke, Bryony Knights, Megan Todd, Rebecca Burton (C) & Jody Wells. subs - Joanne Hooper, Jade Copeman & Sarah Howard. 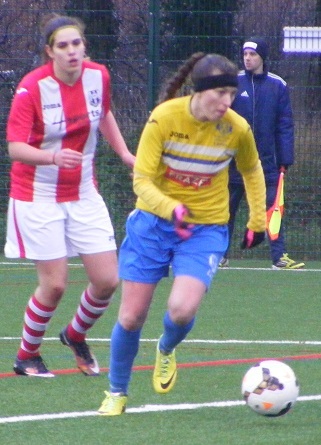 King's Lynn Town Ladies starting XI - Christina Vivas Artacho, Winnie Lee, Lisa Wilson, Albany Hodgson, Emma Woods, Bethan Jones, Taylor Sarchet, Jade Kelly, Becky Russell, Shelley Woods (C) & Oksana Imanalijeva. It's Acle to kick-off the 1st half, wearing red and white vertical striped shirts, white shorts and red and white hooped socks, with King's Lynn lined up opposite wearing yellow shirts, with blue shorts and socks. The home side push players forwards at the start Alice Ladbrooke playing the ball out to Megan Todd on the right wing, drives forwards with the ball flashes a cross into the area race wide behind the goal. A lively start from both sides, Bethan Jones sliding in to win the ball in the middle plays it forwards early looking for Shelley Woods, the King's Lynn captain looking to make a run through the middle, her 1st touch a little heavy allows the Acle defence to get back on her regain possession and sending it long, King's Lynn goalkeeper, Christina Vivas Artacho is out of her area quickly to win the race for the ball. Starting and attack on the right full-back Winnie Lee brings the ball on playing it forwards for Becky Russell ahead of her sends the looping cross into the box, moving right side Oksana Imanalijeva brings the ball down well with her chest inside the area knocking to down right of goal shoots as she reaches the six yard box the ball is blocked at the near post as the Acle defence goes with her. Acle's front two link up captain, Rebecca Burton, only just returned to action after a two month injury layout pressures the King's Lynn defence, has Jody Wells in close support rolls the ball forwards for her outside the box, Wells back to goal holds the ball up before laying it back to Burton who goes for the 1st time strike sending her shot over the bar. Acle win a free-kick inside the King's Lynn half on the right, Anna Larkins over the ball sweeps it high in towards the far post area, Todd gets up highest, getting her head on the ball can't direct it on target. King's Lynn get forwards on the right the cross in across the face of the area is intercepted by Chloe Shields rolled into the midfield for Amber Rowland to carry forwards, player break threads the ball into the path of Wells 30 yards out is closed down quickly by Jones still manages to get a shot away her effort flying over the crossbar. Chances for both sides early on King's Lynn getting joy out wide play the ball out to Russell high on the right wing, fires a ball in across to top of the area, good control from Shelley Woods inside the D to kill the ball and turning hits the shot in the half-volley, arrowing for the top corner, Acle goalkeeper, Chloe Nixon produces a fantastic save a full stretch tipping the ball over the bar for a corner kick. King's Lynn are encouraged by their bright start, pressing Acle on the ball is a competitive match, Russell with another surge up the right wing gets the corner taking it herself is an inswinging ball flies across the six yard box low no one can get a touch as it kisses the far post running wide for the goal-kick. Bryony Knights has possession of the ball on the left side for Acle, plays the ball inside for Wells she is closely marked by King's Lynn's Emma Woods, the ball is won by the defender played into Taylor Sarchet in the middle and on quickly for Shelley Woods in attack a good 30 yards from goal wastes no time in shooting the ball landing in the side netting. Shelley Woods reacts quickest to a poor kick out of the area from Nixon, dropping to the King's Lynn captain 25 yards out drives on towards the top of the area moving right of goal Kate Pasque gets back on her shoulder as Nixon comes to close the angle, Woods shoots, Nixon throwing herself to the right makes the save pushing the ball wide across her area conceding the corner. Acle launch a counter attack from the corner, a strong run on the ball from Luka Goodchild from left-back sends the ball on into the area near post, Wells can't quite reach it. Acle make a change, Joanne Hooper on in midfield replacing Rowland. Acle have another free-kick on the right inside the King's Lynn half the ball is played into the area, Todd the target again gets up for a free header, a tall player knocks the ball down into the ground inside the six yard box is straight at the goalkeeper, Vivas Artacho dropping to the floor and making the save. Both sides are pressing looking for the opening goal, Acle over load the right side win a throw taken quickly into Wells turns inside towards the box moving across the face of the area is fouled as she cuts the ball into the area for Burton, no advantage play is brought back for the free-kick 20 yards out right of goal, Wells to take it goes for goal sends the ball over the bar. Albany Hodgson does well at the back closing down Knights as she is playing in moving in field from the left getting into the area Hodgson slides in to take the ball away from her out for a corner kick, Played in from the right, Todd in a central position outside the six yard box is allowed another free header, drops the ball wide trying to direct it into the bottom corner. More attacking play from Acle down the left Ladbrooke sending Knights in down the left swings the ball in across the six yard box, Vivas Artacho gets down but spills the ball out into the middle of the box, Emma Woods gets their before the Acle attackers the ball is cleared long out to the left side, picked up by Imanalijeva the striker takes it up the wing has Jade Kelly on that side with her lose sight of both as the crowd get excited, a shot comes blazing in however from distance, Nixon throwing herself to her right can't get to it the ball past her cannons off the post and deflects behind for a goal-kick. GOAL! 27 minutes into a busy 1st half Acle go straight up the other end from the goal kick and take the lead the ball is played quickly through the midfield and a perfectly weighted pass picks out Todd as she cuts inside from the right, takes the ball on into the area, right of goal sends her shot across Vivas Artacho and into the back of the net to score her on her debut 1-0. GOAL! A blow for King's Lynn after matching Acle competitively for nearly half an hour find themselves 2-0 down just a minute after conceding, Acle get forwards down the right Larkins linking up Todd, a corner is won. The ball is fired in along the six yard box, comes straight at Pasque central, at head height a difficult ball to deal with, can't jump no time to stoop either makes good contact with her forehead turning the ball towards goal and into the back of the net 2-0. King's Lynn look for a response Sarchet getting the ball up to Shelley Woods moving out to the right turns towards the area holding it up before playing it back to Russell moving towards the right corner of the box, shoots her low drive held by Nixon at her near post. Acle attack down the right the ball played inside is helped on towards Burton who is fouled right on the edge of the area a shove in the back is OK after treatment, Larkins over the ball right of goal, Wells is free unmarked 20 yards out in a central position Larkins rolls the ball into her path fires the ball into the area too many bodies to squeeze through the shot is blocked. Shelley Woods and Imanalijeva combine up front for King's Lynn the ball with Woods on the right turns inside reaching the area lays it across the face for Imanalijeva inside the D, digs the ball out from under her feet sending a rising shot goalwards, Nixon palms the ball down and gathers cleanly. Another chance for Imanalijeva moments later as Emma Woods breaks up an Acle attack gets the ball up field to Shelley Woods passes it out to Imanalijeva left side outside the area meets the ball 1st time slicing her shot away from goal. A throw for King's Lynn on the left inside the Acle half Kelly into Imanalijeva heads the ball on towards the far post Shelley Woods coming onto it as it arrives in the six yard box fires the ball wide across the face of goal. Picking up the ball in half way Burton carries it forwards picking out Todd on the right, holding the ball up looks to spin in behind get into the area, Emma Woods goes with her gets a foot on the ball to push it on for Vivas Artacho to launch out of the area. GOAL! Into the last 5 minutes of the 2nd half, Burton with another run from half way has Larkins bursting forwards on the right getting ahead of her rolls the ball into her path taking in on down the wing squares a fierce cross in across the six yard box, Vivas Artacho throwing herself forwards can't quite reach it, nor can Hodgson tracking back, somehow Wells gets in between them and pushes the ball over the line to make it 3-0. GOAL! Acle continue to attack late on in the 1st half, are hit on the break as Lisa Wilson wins the ball back plays it infield the ball on through the middle finds the attackers Shelley Woods and Imanalijeva next to each other in a central position 25 yards from goal, it's Imanalijeva who spins inside with the ball, a surging run into the area reaching the top of the six yard box fires her shot past Nixon to pull a goal back for King's Lynn 3-1. 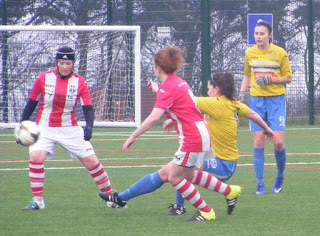 An action paced 1st half Acle United Ladies leading the quarter final 3-1 at the break as the rain starts to slow and eventually stop. A competitive battle King's Lynn encouraged by a positive start had chances to take the lead, Acle prepared to push bodies on at timely intervals getting into a quick-fire 2-0 lead, more chances followed, Acle going on to score a 3rd goal, that scoreline harsh on King's Lynn going into half-time they pulled a goal back before the whistle to keep the deficit down to 2 goals. It's King's Lynn to kick-off the 2nd half. A change for Acle at the break, Burton off, Hooper moving up front with Rowland back on in midfield. Sarchet closes the ball down quickly in midfield for King's Lynn played the ball backwards for Emma Woods who sends it long over the top with Shelley Woods breaking in behind the Acle defence, Nixon quick quickly off her line to come sliding in and smothers the ball on the edge of the area. Shields with a good tackle deals with a high ball put in from the right for Acle. An early switch 2nd half for King's Lynn with Kelly the player substituted, Natalie Bunton coming on, is involved in the action straight away as Sarchet bringing the ball on through the middle releases her on the right wing, takes on the early shot outside the area the strike off target. The 2nd half has started in a similar tempo to the 1st half, both sides looking to attack, Acle's Wells has the ball on the left 25 yards from the King's Lynn goal opens up her body as she shoots sending a curling ball wide of the far post. A good turn in the ball by Shelley Woods as the ball is played into her 25 yards out back to goal, escaping her marker lays the ball forwards for Russell on the left, taking the ball to the by-line is tackled by Shields the throw leading to a corner kick, swung in from the left towards the top of the area, won by Ladbrooke the ball is cleared, King's Lynn regain possession come forwards the ball played into the box claimed by Nixon. Acle press players forwards, Larkins going past Todd as the ball is held up by Hooper outside the area rolls it towards the on coming full-back shots the ball flying straight into Vivas Artacho's gloves the keeper positioned in the centre of her goal. Sarchet gets forwards for King's Lynn as Shelley Woods has the ball out on the right for plays it across the face of the area, meeting it Sarchet fires a shot in across the keeper, diving full stretch to her right, Nixon makes the save pushing the ball wide of her goal. Larkins nips in to win the ball on the right inside the King's Lynn half fires it into Wells holding position outside the area right of the D, Hodgson gets a toe on the ball to stop her turning in behind, Wells gets back on the ball pushed wide lifts a cross towards the far post Todd coming in puts her shot wide of goal. A 50/50 tackle in the centre of the park leaves Sarchet down on the floor clutching her ankle in alot of pain, play is stopped looks a nasty one, receives lengthy treatment on the pitch, cannot carry on with her ankle now heavily bandaged is helped of the pitch, Emma Corbyn joining the action. GOAL! Play held up for 4-5 minutes it's Acle who take advantage going on the attack the ball played up to right Todd on for Larkins taking the ball into the corner sends the cross long across the six yard box, Wells is their the ball behind her, thinks about the overhead kick, however Knights is right behind her, meets the ball 1st time sending it under the diving goalkeeper 4-1 extending Acle's lead with around 25 minutes left to play. GOAL! As in the 1st half one goal is quickly followed by another however it isn't Acle who extend their lead further. The ball is with Shelley Woods receiving it from a throw on the right side is inside the area, right corner shoved over the referee pointing to the spot, it's Woods herself to take it Nixon guesses right dives to her right but the ball is placed perfectly by Woods into the bottom corner of the net 4-2. A rush of blood moments later from Nixon as the Acle keeper comes rushing out of her area as King's Lynn, Shelley Woods is played in behind, gets to the ball 1st taking it past the stranded keeper on towards the edge of the box, Larkins gets back just in tome to stop Woods taking an early shot into an empty net, by the time the striker manoeuvres herself into a position to shoot her strike is cut out by Pasque and the threat cleared. King's Lynn bring Kelly back on replacing Bunton. Nixon hasn't been put off coming out for the ball the save is needed as Shelley Woods sends Kelly through on the right, the keeper coming outside the box making it the ball before Kelly can push it past her. A change of formation for King's Lynn as they look to try and pull a goal back, Wilson off at right back, Bunton back on to join the attack as they go 3-4-3 as the game moves into the final 15 minutes. Rowland takes the ball forwards for Acle playing the pass out to Todd on the right, 30 yards from goal is given time and space to line up a shot, whips the ball in towards goal, isn't too far over the cross bar. Knights with a strong run on the left wing gets a corner for Acle the ball is playing into the middle, Pasque jumping highest heads the ball down into the ground right in front of Vivas Artacho the goalkeeper down quickly getting hold of the ball. 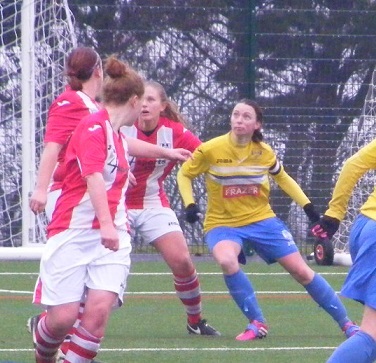 A minute later up the other end Pasque head the ball clear of her area as Hodgson lifts in a free-kick from halfway. Corbyn wins a 50/50 ball on the right plays it down the line for Bunton ahead of her travelling with the ball getting into the box on the right tries to cut the ball back into the six yard box from the by-line, Nixon has come the ball under her feet adjusted well to stab the ball away. Acle have a throw on the left, played in field into Rowland she attempts to lift the ball over the top for Todd breaking into the area, coming forwards Vivas Artacho get's her gloves around it 1st. Into the last 10 minutes and Acle are looking for a 5th goal. The ball is played into Wells 20 yards out, tries to turn, Emma Woods wins the tackle the the foul for King's Lynn. GOAL! No let up in the energy both sides keeping up a good tempo, Acle have possession with Rowland in the middle a good move sees her play the ball up to Wells outside the box on the right side this time, holding the ball up has support from Todd lays the ball back to her, Todd with a burst of pace drives into the box goes to shoot is brought down by Jones the penalty kick awarded. It's Todd herself to take it, hits the ball low and hard to the keepers right beyond Vivas Artacho's outstretched gloves into the bottom corner 5-2 with just a couple of minutes of normal time left on the clock. GOAL! Again King's Lynn respond with a goal, after a 20 strike from Imanalijeva is held by Nixon before King's Lynn win the ball from the kick out is played over the top Shelley Woods beating the offside trap and Nixon as the Acle goalkeeper comes out to close her down taking the ball to the left of goal, turns and lifts her shot over the defenders racing back to drop into the net beyond, 5-3. Into injury time Acle make a double switch, Jade Copeman and Sarah Howard on for Goodchild and Ladbrooke. A late chance for Acle who have the ball on the left getting a throw the ball is played into Knights fires a diagonal ball in across the face of the King's Lynn goal, throwing herself at it far post Howard can't get anything on the ball to deflect it goalwards. A 5-3 win for Acle United sees them through to the semi-finals of the Norfolk Women's County Cup, a highly entertaining match plenty to cover, both sides playing their part in a competitive performance, both intent on attacking throughout the 90 minutes. King's Lynn can take alot away from the match a good test for their side that continues to improve. Acle with some good attacking play getting players forwards will fancy their chances in the semi-finals, where they will be joined by Wymondham Town Ladies who beat Stalham Town Ladies 7-1 and last seasons beaten finalists Aylsham FC Ladies who beat Briston Wanderers Ladies 3-2 away from home the winning goal coming in the last 30 seconds. 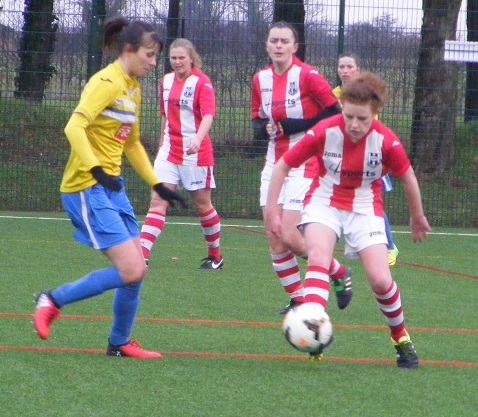 Holders Thorpe United Ladies will be away to Bohemians Ladies next Sunday. 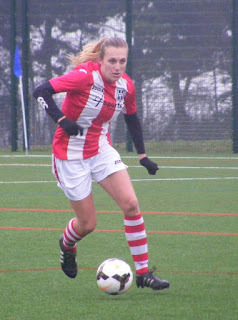 A tough one this Sunday with so many players putting alot of effort into 2 good team performances, but with her 2 goals on debut I've chosen Megan Todd, her pace and power on the ball adding a new dimension to the Acle United Ladies side. A great cup tie, entertaining plenty of goals and the rain even stopped. 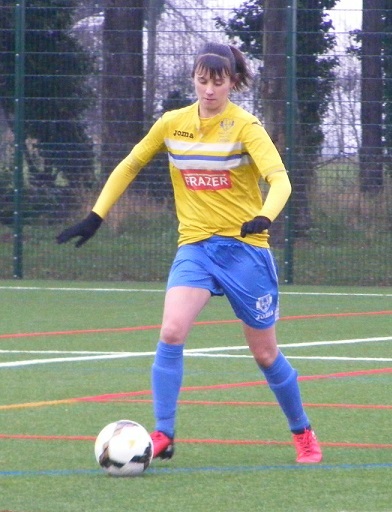 My thanks to both sides for their help with the team and sending my best wishes to King's Lynn Town Ladies, Taylor Sarchet hope she isn't too badly injured and makes a speedy recovery.